It is difficult for scientists in Germany to continue working in academia long-term after completing a doctorate. They have to compete with each other for a small number of permanent positions. As an alternative, why not ​​place the narrow bottleneck for long-term perspectives in research directly after the doctorate? 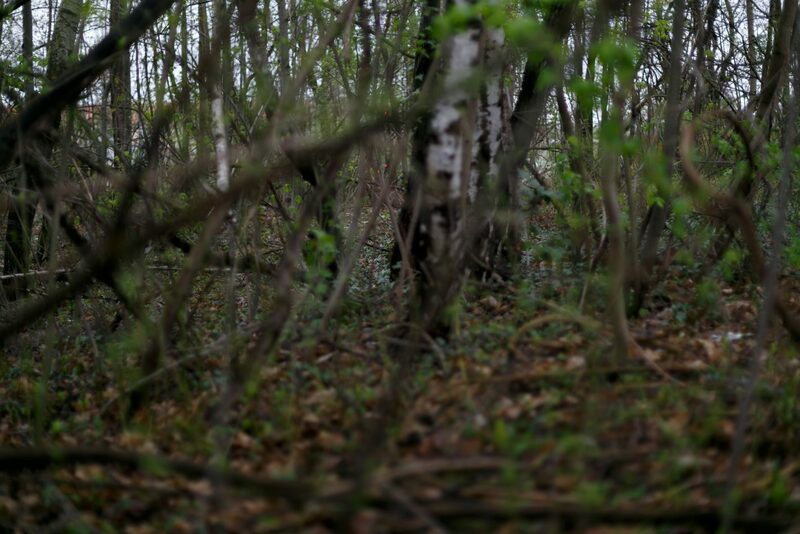 On a fallow land, near the Technischen Universität Dresden, trees are growing. A large number of young shoots appear in spring. They seek their way, sometimes with a complicated path, towards the light and into their own space. Even if many seeds germinate, in the end, there is only enough space for a few trees. This is natural selection. Plants grow, rather than weeds, according to nature’s whims. Since there are programs for the promotion of young scientists in the academic apparatus, that is to say there is planning and preparation, this image from botany can only be transferred to the academic system in a limited way. Overall, however, I have the impression that very little is done directly to shape the career prospects for young scientists. I am postdoc, a scientist with a PhD but without management related duties. As far as my career prospects are concerned, I am faced with a very narrow bottleneck. Most of my colleagues, like myself, are very happy and motivated to do science, but only a very few of us will obtain a permanent position. Such conditions are far from what is excellent or even good, in order to be able to concentrate on discovering the unknown in freedom. There is a need for basic job security in order to be able to do well in research and teaching. It seems strange to me when I read about the objectives of the excellence initiative as they are found in the internet: “The initiative for excellence strengthens universities as places for the training of young academics. The universities are thus becoming more attractive for outstanding students, academics from Germany and abroad.” [translated from German] This is honest and makes me realize why I do not perceive this initiative as positively as it is presented by academic institutions and politicians. It is obviously not intended for me as a scientist, but for the universities, which need doctoral students and through this initiative can pick the most promising from a larger pool. The university then hopes to collect points with competitive scientists in order to move higher in rankings relative to other institutions. For the individual scientist, however, this means a tougher battle in a globalized market. A competition between scientists and the university takes place here at the expense of teaching and research. Universities and research institutes do not directly focus on a critical analysis of good teaching and research, but rather use exact and general variables such as third-party totals and can be distracted by the exact of the essential. In the end, unfortunately, it is not necessarily the self-analytical, self-critical and humble scientists stay in this system, but rather those who can sell themselves and their research well. Instead of a good cooperation, a strong competition is promoted. Even if one has a job, full freedom to research is not guaranteed. It is necessary to prepare results for the next assessment, the next application, the next job, in short, the preparation for the next request for money, although research cannot guarantee a result in advance. I regard the conditions for me as a researcher by no means as “excellent”. Job safety is a very basic necessity. In the Maslow’s hierarchy of needs, it occupies the second-lowest level. The motivation of people through uncertainty leads to the need to repeatedly justify ones’ professional existence as a scientist. This leaves little room for cooperative and self-critical science. As a cause for the vehement defence of the time-limited contracts, I suspect a naturally grown structure that stabilizes itself in its current form. A distribution of power does not occur automatically. The short-term working conditions create an incredible power monopoly for professorate and politicians, however, the distribution of decision-making power to academic self-government and politics makes it difficult for the individual politician or professor to change anything. I feel as if I am at a crossroads, where the priority-to-the-right rule applies, and on every corner, is a car. One for the universities, one for the non-university research institutions, one for the German states and one for the federal government. All keep to the priority-to-the-right rule and nobody can move. There is no recognizable attempt at solving this blocked situation. My idea of a future job in teaching and research would be sufficiently secure and dynamic. To be dynamic, I am willing to change the establishment, not necessarily the place of residence, at least every 8 years. The change should preferably take place between university and a non-university research institution. Security is provided through a permanent and appropriately paid employment contract, including equipment for teaching and research activities. 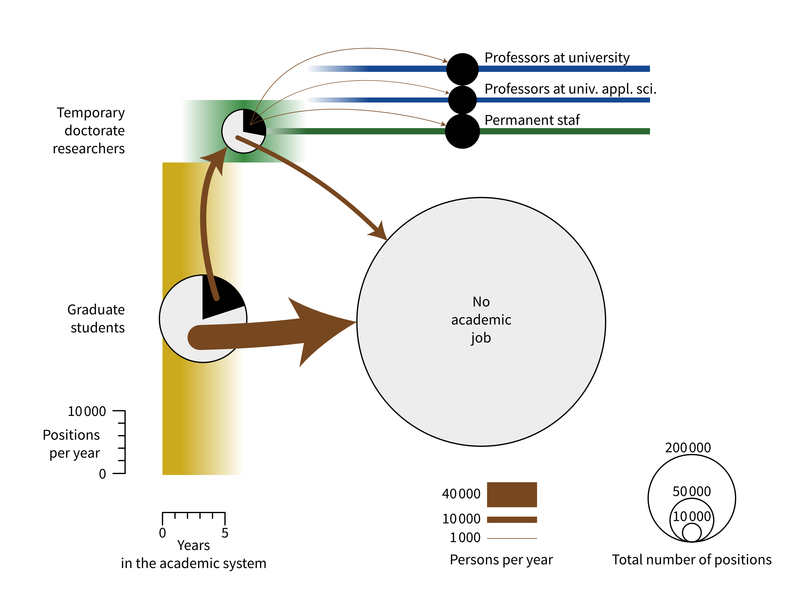 The academic system is well financed in Germany – and yet my proposed position does not exist. I am not concerned about simply asking for more money and thus solving the problem. I think a restructuring is needed that changes the geometry of the suddenly narrowing bottle neck for postdocs and creates healthier relations. In the following I use only orders of magnitude, ignore temporal changes of job numbers and take data from the federal report on young scientists 2017. If more accurate data are available, I would like to clarify my estimates. But the precise should not distract from the essential. Currently, there are about 200,000 graduate students, about 50,000 temporary researchers with a doctorate (postdocs, research group leaders, assistant professors, temporary professors, …) and about 25,000 professors at universities as well as about 20,000 at universities of applied sciences. In addition, there are about 30,000 positions as permanent scientific staff. The PhD phase takes about 4 years. The time after the doctorate is about 10 years, but many leave the academic apparatus after only a few years, so I take 5 years for the mean duration of this phase. Professors are appointed for about 25 years. This results in the following positions per year: about 50,000 new doctoral candidates, about 10,000 new researchers with a PhD title, about 1,000 new professors at universities, about 800 at universities of applied sciences and about 1,000 new permanent academic staff. Thus, the percentage of doctoral candidates who stay after graduation, is about 20%, that of post-docs who get a professorship at about 18%, and another 10% work in the long term as permanent staff in academia. Thus, about 6% of the doctoral students come to a permanent position in academia. I do not regard this as healthy relations and good ways for young scientists, since the temporary scientists, especially after the doctorate, have a professorship in mind as a career goal and are preparing for this. However, this option is not available to the majority. There is still the permanent scientific staff, but they are directly linked to the instructions or dependent on the favour of the professors and thus does not have full freedom in teaching and research. Life histories in the current academic system in Germany over lifetime. Circles according to the number of places, connecting lines indicate the persons per year, which change from position to position. From my point of view, a healthy relation would be achieved if a postdoc had a concrete chance for a permanent position. If it would be more likely to be able to remain in the academic system after a “trial period” rather than to leave it. For the change of the bottle neck geometry, I propose the introduction of permanent positions for lecturers and researchers, similar to the CNRS system in France. In the following, I simply assume that the cost of a job is independent of the professional experience. A cost-neutral modification therefore corresponds in the graph to an equal-area deformation. The money for permanent researchers comes from the group of temporary scientists with a PhD title, for whom only about 25,000 positions are now available. However, there will then be some 25,000 permanent positions for lecturers and researchers after the reorganisation. Now only about 10% of the doctoral students remain in science after obtaining the PhD, of which about 73% will get a permanent position later on. Of the doctoral students in turn, there are about 7% who remain permanently in science, instead of about 6% today. Life histories after the proposed restructuring in Germany over lifetime. Circles according to the number of places, connecting lines indicate the persons per year, which change from position to position. This change would slightly enlarge the narrow bottleneck for a long-term scientific career and place it at an earlier stage in life. If someone cannot find a job, this is a very clear signal that there is no long-term perspective for him in academia. For the entire academic system, more independent and critical thinkers would be available. The acquired knowledge and the experience would be maintained over longer periods. There is also less competition among each other and thus more potential for a constructive coexistence. Long-term perspectives allow us to pursue even risky projects. It may not please every professor to have a few critics at their side; However, a sincere scientist will be happy about them. The proposed position of a permanent researcher, or lecturer, needs a dynamic component. Here I suggest to change the institution at least every 8 years. This creates independence from professors and promotes exchange between institutions and groups. It also facilitates the transfer of knowledge from research institutions to higher education institutions and vice versa the good contact with suitable graduates. In order to ensure homogeneity in terms of age, it is crucial for the restructuring that the desired number of positions is available per year and not in a single year all positions are filled with the same age group, as my colleague Prof. Holger Kantz noted. I also propose to work for a limited period after the doctorate, such that the researcher can develop his own profile and gain experience in various activities such as teaching, project management and the search for research ideas. However, these years should be sufficient as a “trial period”, because after that a scientist has shown long enough what his performance is and does not have to continue to legitimise his career choice again and again. This restructuring would, of course, take power from the powerful in the present system, which they would not voluntarily abandon. But these are, after all, scientists and politicians who make the decisive decisions. 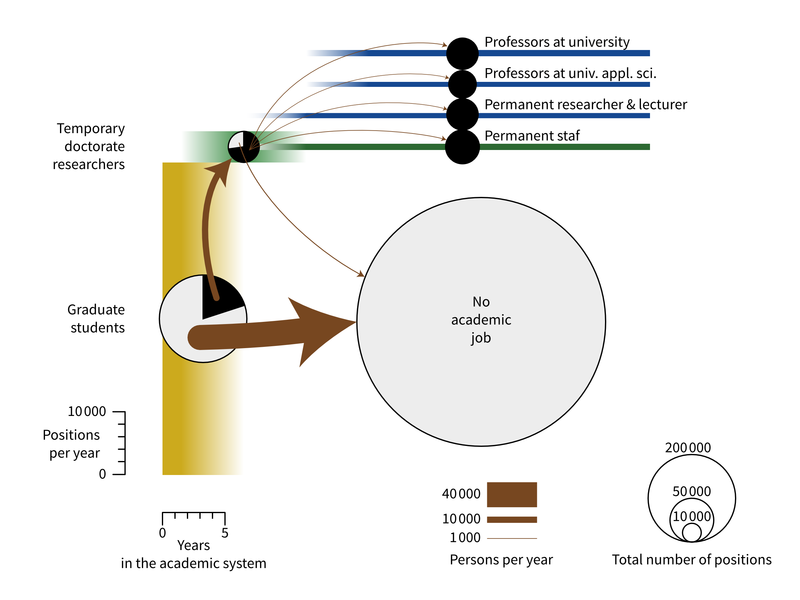 After the restructuring, for the individual professor there are fewer scientists available and the politicians can no longer influence the research direction in full with temporary funding. This would require more commitment from the individual scientist to pass on the knowledge to society and colleagues, but also to listen to what relevant research topics are. Science is made today by scientists and not by the buildings and institutions in which they work. The institutions are an important prerequisite, but more important is a cultured approach to scientists. Perhaps a politician can get involved in a major ceremony, where scientists are getting tenured instead of taking part in a ground-breaking event of a building where millions of euros are invested in the casing? It should be noted here that probably a large proportion of the German managers in the private sector and the administration had their first employment relationship in the academic world. What they have experienced will also serve as a model for their later actions. The restructuring proposed here will require time to implement, but small steps can ease the problem. First of all, it is necessary to consistently provide information about the long-term perspectives and possible risks of a temporary activity in the academic system, as well as a comprehensive offer for the development of soft skills and professional orientation, in order to be well prepared for the most probable way: leaving the academic system. I am confident that in the dialogue a way out of the situation can be found. However, this path requires joint action by the federal government, the states, non-university research institutions and universities. Not to try, would be bad for science! I wish for a respectful and cultivated approach towards scientists. Also, the view of their CVs should not be missing. It is an important task to select the researchers and lecturers well and give them space and time for their task. Trees are cultivated today in tree nurseries with a view to the demand and are planted at the right time – only then can they unfold freely for the sake of the environment. This is a translation of my German blog entry on Perspektive Wissenschaft.